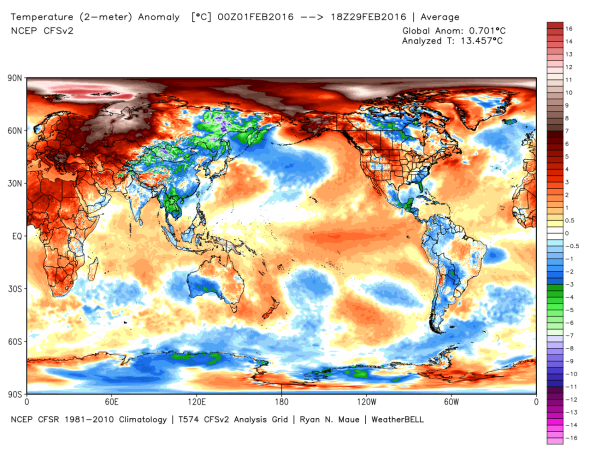 NASA confirms February 2016's shocking global warming temperature record. 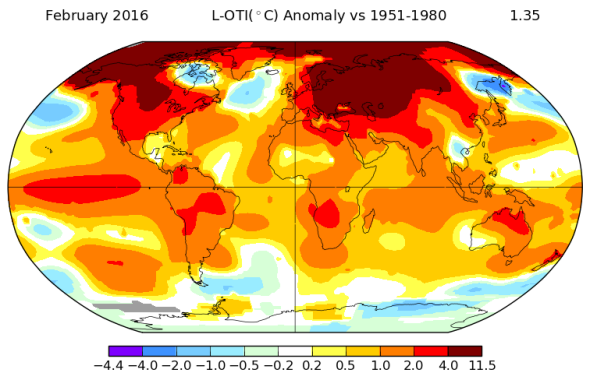 NASA has confirmed that our planet’s temperature surged in February 2016—past a major milestone. NASA’s global temperature data is measured from a 1951-1980 baseline, about 0.3 degrees warmer than pre-industrial levels. That means February 2016 was the first month in history that global average temperatures passed the 1.5 degree Celsius mark. Also, since last month’s warmth was concentrated in the Northern Hemisphere (2.76 degrees Celsius warmer than the 1951-1980 baseline) and the Arctic (5.36 degrees Celsius warmer than the 1951-1980 baseline), these regions of our planet were also record warm, likely the warmest they’ve been for at least thousands of years. As I said in the previous version of this post—even though this surge of warmth is likely only temporary, it is a major milestone moment for humanity and our relationship to our planet. Update, March 3, 2016: Since this post was originally published, the heat wave has continued. As of Thursday morning, it appears that average temperatures across the Northern Hemisphere have breached the 2 degrees Celsius above “normal” mark for the first time in recorded history, and likely the first time since human civilization began thousands of years ago. * That mark has long been held (somewhat arbitrarily) as the point above which climate change may begin to become “dangerous” to humanity. It’s now arrived—though very briefly—much more quickly than anticipated. This is a milestone moment for our species. Climate change deserves our greatest possible attention. Global temperatures hit a new all-time record high in February, shattering the old record set just last month amid a record-strong El Niño. Original post, March 1, 2016: Our planet’s preliminary February temperature data are in, and it’s now abundantly clear: Global warming is going into overdrive. It also means that for many parts of the planet, there basically wasn’t a winter. 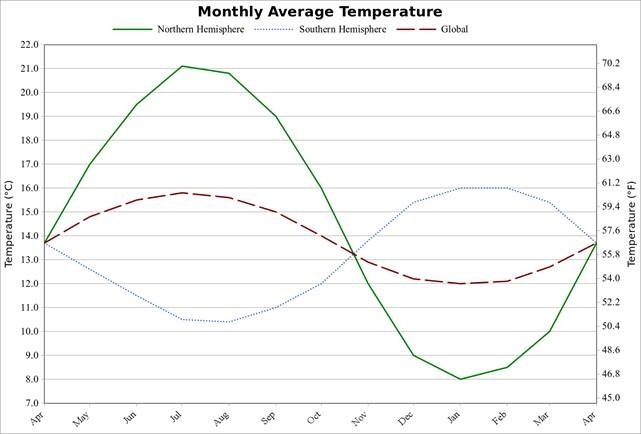 Parts of the Arctic were more than 16 degrees Celsius (29 degrees Fahrenheit) warmer than “normal” for the month of February, bringing them a few degrees above freezing, on par with typical June levels, in what is typically the coldest month of the year. In the United States, the winter was record-warm in cities coast to coast. In Europe and Asia, dozens of countries set or tied their all-time temperature records for February. In the tropics, the record-warmth is prolonging the longest-lasting coral bleaching episode ever seen. The northernmost permanent settlement, Norway’s Svalbard archipelago, has averaged 10 degrees Celsius (18 degrees Fahrenheit) above normal this winter, with temperatures rising above the freezing mark on nearly two dozen days since Dec. 1. That kind of extremely unusual weather has prompted a record-setting low maximum in Arctic sea ice, especially in the Barents Sea area north of Europe. Of course, all this is happening in the context of a record-setting El Niño, which tends to boost global temperatures for as much as six or eight months beyond its wintertime peak—mainly because it takes that long for excess heat to filter its way across the planet from the tropical Pacific Ocean. But El Niño isn’t entirely responsible for the absurd numbers we’re seeing. El Niño’s influence on the Arctic still isn’t well-known and is likely small. In fact, El Niño’s influence on global temperatures as a whole is likely small—on the order of 0.1 degree Celsius or so. So what’s actually happening now is the liberation of nearly two decades’ worth of global warming energy that’s been stored in the oceans since the last major El Niño in 1998. Almost overnight, the world has moved within arm’s reach of the climate goals negotiated just last December in Paris. There, small island nations on the front line of climate change set a temperature target of no more than 1.5 degrees Celsius rise by the year 2100 as a line in the sand, and that limit was embraced by the global community of nations. On this pace, we may reach that level for the first time—though briefly—later this year. In fact, at the daily level, we’re probably already there. We could now be right in the heart of a decade or more surge in global warming that could kick off a series of tipping points with far-reaching implications on our species and the countless others we share the planet with. *Correction, March 4, 2016: Due to a data error at Weatherbell Analytics, the graphic added in the March 3 update to this post showed that in recent days, the temperature had reached approximately 2.5 degrees Celsius above pre-industrial levels. The graphic has been replaced with an updated version showing a less dramatic temperature spike, to approximately 2 degrees Celsius above preindustrial levels, though still exceeding 2 degrees Celsius when measured from pre-industrial levels. 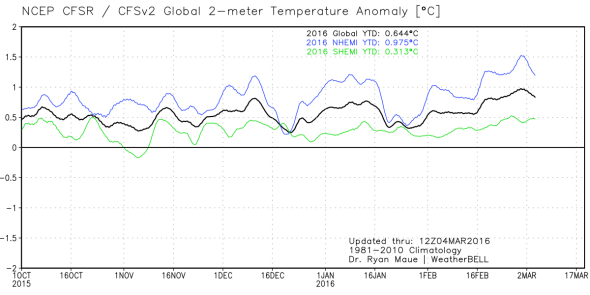 This spike has been reproduced in a separate dataset, so there remains high confidence that the 2-degree level was breached. *Correction, March 28, 2016: An update to this post originally misstated the record-breaking nature of February 2016 global temperatures. It was the most unusually warm month on record, not the warmest month on record.